Sayagaki: written by Dr. Kanzan. 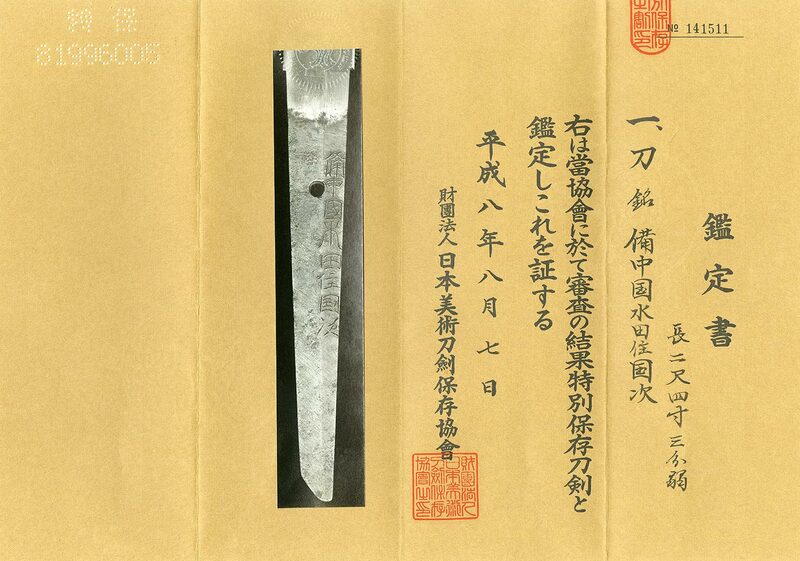 Bicchu Kuni Mizuta Kunitsugu, this blade is a masterpiece, blade length is 73.7cm. Blade length :　73.7　cm or 29.015 inches. Width at the hamachi : 3.18 cm or 1.25 inches. 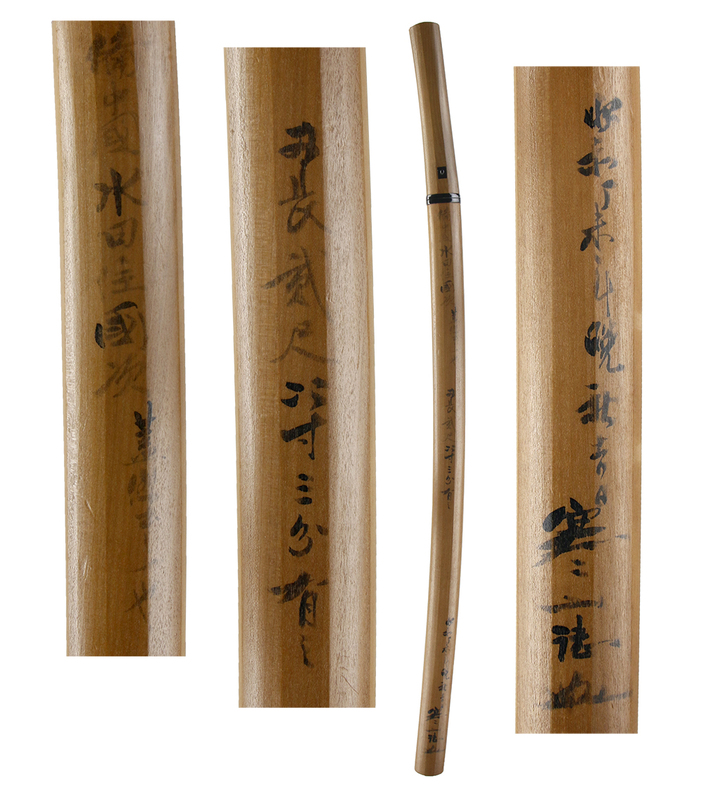 Width at the Kissaki : 2.22 cm or 0.87 inches. Shape : wide and thick, Okissaki blade. The Jigane is blakish and Hadadatsu. There are Chikei. Shinogi-Ji: Itame Hada and Masame Hada with Yaki. thick Nioikuchi Suguha with many Ashi. Boshi is Midare Komi round shape. Special feature: Bicchu Kuni Mizuta Kunitsugu studied under the Mizuta Kunishige. He had complete mastery over the Kunishige style. Saya : Kawari Nuri Saya. are engraved with gold and copper color. Menuki : Oni devil and Zhong Kui are engraved with gold color. Fuchikashira: Shimuichi plate, scene of Setsubun is engraved with gold color. From Aoi Art: Mizuta Kunishige has a unique atmosphere. Gunome Midare has thick Nioikushi. And also he made Suguha Hamon. his blade has large Gunome Hamon. It looks like Doranba. There are many Ashi. On the Shinogiji, there are Yaki. This blade is a masterpiece of Mizuta Kunitsugu.